My first thought was some sort of racers but it only looks like they have 2 wheels. Lol Lavada. 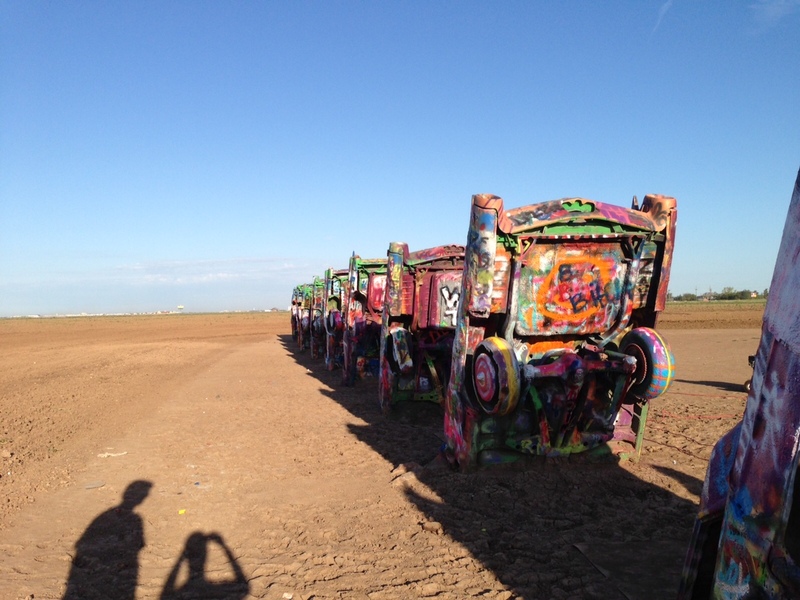 It’s the Cadillac Ranch in Amarillo, Tx. I had seen these some time back, but they weren’t painted.Hmmmmm….I bet they are some sight in the sunset! They now redo them periodically and then encourage graffiti. I’ve never been temped to indulge, but hand me a spray can! He has your sense of humor,huh? Yep. Both my kids do. Wow. Cool display. I’ve got to show hubby. He’ll get a kick out of this. Hey, wait a minute. When were you in Texas? I wasn’t in Texas. The son and spouse drove to Colorado and camped/hiked the Rockies. This chick don’t hike. I stayed home with Fur Face. I told them this picture reminds me of Mystery Science Theater 3000 with their shadows in the foreground.